First, it was Putin’s political moment. In November last year, the Russian president was snubbed and marginalised by his counterparts during the G20 in Australia, leading to his precipitated departure. Last June, he was not even invited to the G8 meeting – which has de facto become a G7. Yet, in Ufa, a smiling Putin could parade along with his BRICS and SCO fellow leaders. This was his way to show the Russian population and the West – read Europeans and Americans – that Russia is not isolated, politically nor economically. 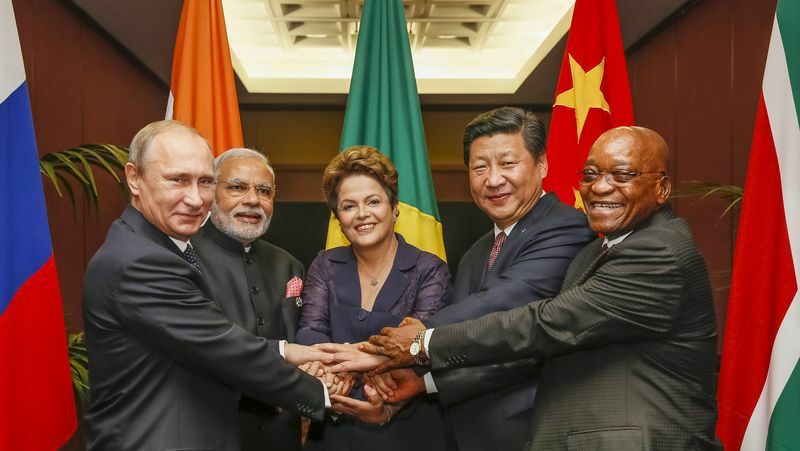 Whereas the West continues to impose sanctions on Russia, the BRICS are deepening their economic and financial cooperation. Indeed, one of the main outputs of the BRICS’ Summit was the ‘Strategy for BRICS Economic Partnership’. The Russian economy could also soon benefit from investments through the BRICS’ New Development Bank, which was formally launched in Ufa. Politically, Russia’s intervention in Ukraine and the annexation of Crimea were not discussed during the summits, which implies a tacit acceptance by BRICS leaders. Moreover, Putin managed to include a paragraph in the final Summit statement whereby leaders condemn all types of sanctions, including economic ones, thus showing solidarity with Russia against the West. Second, the axis between Moscow and Beijing is developing to a new level. The BRICS and SCO are two regional/multilateral organisations that are driven by two key members: Russia and China (India was just formally accepted as a member to SCO, along with Pakistan). Although these two countries signed a ‘strategic partnership’ in 1996, calling notably for a ‘multipolar order’, the relationship was always fraught with distrust and competition. It has long been described by analysts as an ‘axis of convenience’. Over the past few months, however, the two partners seem to have gotten considerably closer to each other. Whereas Europe is seeking to lower its dependence on Russian oil and gas, Moscow and Beijing just agreed on several major energy deals. China will now have access to much-needed resources, while Russia will finally be able to connect itself structurally to the hungry Asian energy market. Politically, although the two powers do not see eye to eye on every international issue, they have recently aligned in a number of international negotiations (on Iran or cyber issues, for instance), and they are very cautious to avoid open criticism when it comes to their mutual core interests (Crimea on the one hand, South China Sea on the other). Even militarily, the relationship is deepening, as illustrated by the joint naval drill in the Mediterranean, last May, which involved nine ships in a traditional NATO/EU pond. The Russia-China axis is still largely driven by opportunism, pragmatism and, to a certain degree, an anti-Western agenda. Russia can get closer to China as it turns its back to the West and seeks a new foreign policy orientation, whereas Beijing plays the ‘Russia card’ every time it needs to show some muscle without confronting the West frontally. It remains largely ‘convenient’ in this regard. Yet, the cooperation agenda appears increasingly ambitious and substantial. In Ufa, the two countries discussed future cooperation and possible integration between their two major but overlapping regional initiatives: Russia’s Eurasian Economic Union and China’s One-belt-one-road strategy. A working group looked specifically into such cooperation opportunities – China’s strategy could for instance benefit from the Eurasian Customs Union. There are still limits to the Russia-China partnership. It is unclear how long Russia will tolerate being the junior partner, and it is equally unclear how long China can tolerate a strong partnership with an unpredictable troublemaker. Nevertheless, this partnership bears a huge potential for shaping regional and global dynamics, one way or the other, depending on how it develops in the future. Third, the meeting in Ufa confirmed that an alternative world order is maturing. The BRICS and the SCO are two organisations that are essentially challenging the established order. All the BRICS countries call for greater representation and power in the multilateral system, which they (rightly) view as dominated by the West. As a result, they have launched new multilateral bodies, such as the New Development Bank (NDB) and the Contingent Reserve Arrangement (CRA), which are set to challenge the World Bank and the IMF respectively. They also try, occasionally, to challenge Western norms and concepts. For instance, Brazil promoted the idea of ‘Responsibility while Protecting’ as opposed to the Western concept of ‘Responsibility to Protect’. Emerging powers do not want to overthrow the established order. In fact, the BRICS final statements always highlight the central role of the UN system, notably. They also try to create connections between their new organisations and existing ones, not least to bolster their legitimacy. The alternative order promoted by emerging powers is thus meant to develop progressively and in parallel to the liberal order. Not to replace it – at least in the short term. A mixture of cooperation and competition is thus likely to drive the relationship between these orders. Eventually, one should ask: what does this all mean for Europe? On the one hand, Europe must continue to show unity and strength vis-à-vis Russia, as long as it maintains its aggressive policy in Ukraine. In this regard, Europeans should reach out to the other BRICS countries, in order to loosen their (tacit) endorsement of Russian actions, with which they feel less comfortable than they dare say. The EU’s ‘strategic partnerships’ with these countries should be fully geared in this direction. Europe should pay particular attention to the China-Russia axis, which could present a huge challenge to its own economy and security in the longer term. The EU-China strategic partnership takes a particular importance in this light, although being highly challenging itself. On the other hand, Russia remains the EU’s biggest neighbour and a pivotal power globally. It is therefore primordial to find a way out of the current political dead end, and to restore cooperation based on pragmatism and mutual benefits. Perhaps the EU should make a first soft move by shaping a new narrative in which opportunities and benefits arising from renewed cooperation would be highlighted, as well as the cost of non-cooperation, while standing firm on key issues such as Ukraine. This would put the ball in Russia’s camp for the next move. Finally, Europeans should not fear an alternative order that does not seek to overthrow the established one. On the contrary, Europeans should ensure that cooperation is on the table between these parallel orders. Furthermore, as Europe’s own over-representation in multilateral institutions is partly responsible for the emerging powers’ dissatisfaction with it, Europeans should start by addressing this problem. Many institutions could also be improved in order to yield more tangible results, which would be more needed than ever in these days of interdependence and global challenges. In sum, the dynamics of changing geopolitics and order were at play in Ufa. They are of direct concern to Europe, which needs to start putting its act together – now.